Tell the Universe your dearest, secret wish. When in doubt, go Up! Look to the Universe for help. You may already pray a lot and have a good connection with the God of your understanding. If you drew this card, see if your prayer can be simply to know what the Universe wants for you. If that’s already how you pray, then keep praying and have faith! If not, then try dropping specific requests and focus on gratitude. Miracles will happen! If you have resistance to praying or don’t really believe it will help, try getting very quiet inside. Just focus on your breath, on making it longer, slower, and deeper. Do this for several minutes—at least three minutes, longer if you are able. Experience your heart beating at the core of your body. Let yourself appreciate how it has been beating for your entire life, and will continue until the end. Feel the issue float on the surface of your heart, exposed to the sky with the sun, the moon, and the stars above. You will feel something shift. That is the message of this card. Part of you is resisting prayer. Denial, laziness, skepticism, and busyness may be blocking you. Consider following the suggestions above RIGHT NOW. Set your timer for three minutes and give it a chance. Then look at the other cards in your spread or shuffle the deck and pull a new card to unlock your heart and get prayer working for you today. 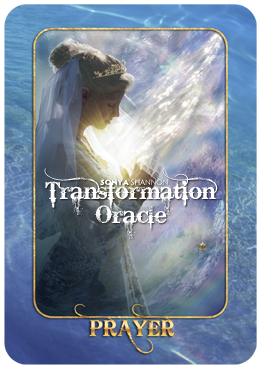 Read Thank You, Problems!, Sonya Shannon’s blog post based on this oracle card.